A very small tool by which you can install Windows 7 from your pen drive. It is very useful for small netbooks in which there is no dvd drive,also, if dvd drive in your computer is not working currently than you can install Windows 7 seven with this tool. 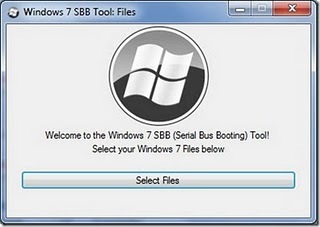 First, We have to create a bootable setup in pen drive from which you can install Windows 7, you need a computer with dvd drive and a pen drive (4 GB atleast because setup of windows 7 is larger than 2 GB), Windows 7 installation dvd. Now ,Insert windows 7 setup dvd into drive and Run this tool.Click on the "Select Files" button. Select the dvd drive where you inserted the windows 7 dvd. Now, it will prompt you to choose pen drive.Select your pen drive and press next. All done!! now your pen drive is ready, you can now boot your computer in usb mode in which you want to install Windows 7. The size of this tool is only 89kb but you need " Microsoft .NET Framework 4" to run this tool.